Today, I wrapped up the project I started Friday and released iOS device connector plugin. In addition to listing all iOS devices, this plugin lets you deploy IPA files from anywhere (in Jenkins build via a build step or outside via CLI) to any of the connected iOS devices. You should be able to select a device without electing a specific UDID, and I’m curious what kind of criteria people needs here. Do you need to be able to say “deploy my app on iPad2 with 16GB memory”, or is “deploy my app to an available iPad” suffice? For this to be useful for automated test execution. I think we need to be able to launch the app (and I assume the tests embedded in the app itself will run and shuts itself down in the end?) How do people do it? Don’t we need to inject the coordinates of the actual device the app was deployed to, so that your build can do more stuff with it? What are other interesting operations to devices. File access? Screenshot? Anyway, the plugin is already released. I hope you find it useful. I was talking to my colleague Mark Prichard about mobile development with Jenkins, and I came up with this idea. If you are doing iOS app testing with real devices, you need to tether the device with a computer so that you can push the app-to-be-tested to the device. In a local development environment, you’d naturally do this by hooking up a device to your laptop. But in the CI environment, we can do better. Imagine if you have a Jenkins master connected to a dozen Mac minis, where each Mac mini is then connected to various iOS devices. There’s nothing stopping Jenkins from listing up all the devices connected to all the slaves. Then based on this information, Jenkins can lease devices to builds. Say someone wants to run a test somewhere. 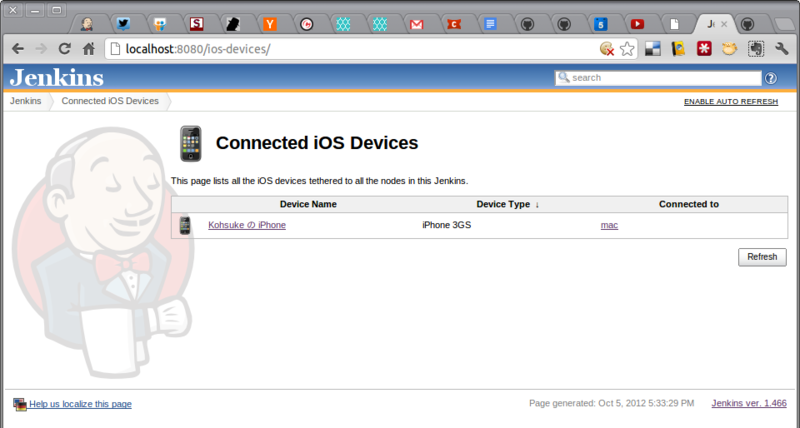 Jenkins can find an unused device and push it, then inject the coordinate of that device to the build. Or how about the axis in a matrix project that allows you to say “I need this test to run with iPhone 3GS,4,5 and iPad 2,3″ then Jenkins will run 5 runs of the tests in parallel? 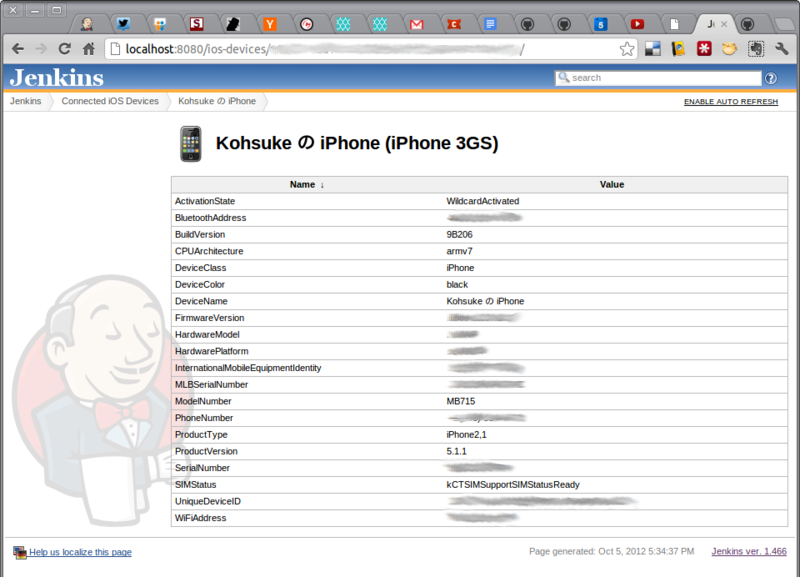 To that end, as a post-JavaOne fun project, I developed a plugin that lists up all the iOS devices connected to Jenkins. I should be able to combine this with something like fruitstrap so that you can deploy apps from anywhere to any device connected to your Jenkins build farm. What do you think? Shouldn’t this be interesting? Any thoughts? Mark Prichard from CloudBees, myself, and Matt Solnit from SOASTA will deliver a joint talk Thursday evening at Silicon Valley Cloud Computing Group. Our part of the talk will take an iOS application and a backend Java server, then discuss how you can set up the pipeline of continuous build and test for them on Jenkins. The demo will be based on the CloudBees platform and we think it’s easier to do it that way than setting everything up on your own, but the setup should equally apply to your local Jenkins installation. Apple has locked down the iOS application development and distribution which makes the automated testing setup more painful than it should be, but because of that, I think a talk like this that shows the whole setup is worthwhile. The event will be Thursday evening, at Yahoo! Campus in Sunnyvale. Please join us if you can. The event is free but requires RSVP. Beer and pizza are provided.